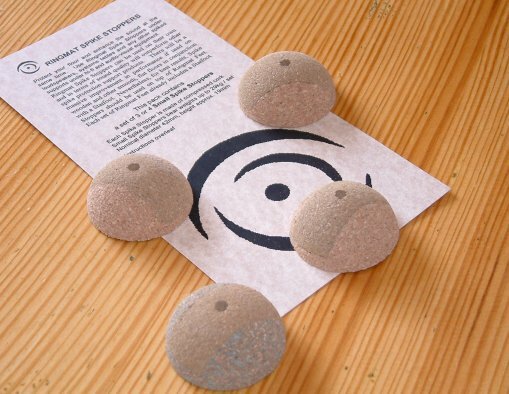 Protect your floor and enhance the sound at the same time. Use Ringmat Spike Stoppers under loudspeakers, systems tables and any other spiked supports under hi-fi and audio-visual equipment. Ringmat Spike Stoppers can be used on their own and in terms of sound quality will outperform other spike protection support products. There will be a massive improvement in performance if used on wooden and other smooth, flat floors in conjunction with a Statfoot. Nevertheless, for best results, Spike Stoppers should be used on top of Ringmat Feet. Each set of Ringmat Feet already includes a Statfoot. 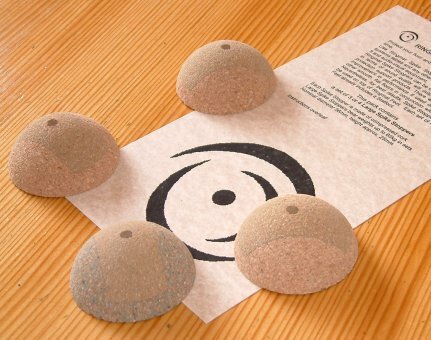 Each Spike Stopper is made of compressed cork. Spike Stoppers are designed to be used on a level surface with the flat base resting upon the surface below (or on top of Ringmat Feet). This allows for the spike in the loudspeaker, systems table or other spiked support to be placed in the spike hole on top of the Spike Stopper. Spike Stoppers are designed to grip the sides of the spikes rather than have the weight bearing applied through the point of the spike. If the spikes are not wide enough to be gripped firmly at the sides in the Spike Stopper holes, wider/fatter versions of the spikes must be used. 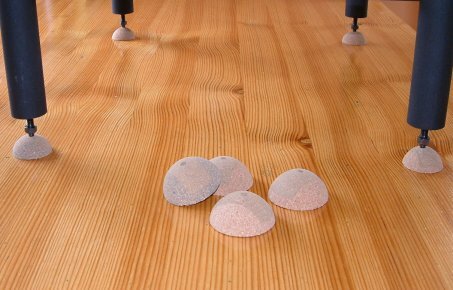 Each set of Ringmat Spike Stoppers contains one denser, blue speckled Dome, where the cork has a synthetic rubber binder. As a general rule, place the denser Spike Stopper underneath the spike bearing the least weight above. For example, if most of the weight carried by the support is at the rear, place the denser Spike Stopper underneath the front right hand spike. If most of the weight is at the front, place it underneath one of the rear spikes. With supports carrying a turntable, place it under the front left hand spike instead of under the front right hand spike. The other Spike Stoppers can then be placed in the remaining required positions. When three spikes are in use, again place the denser Spike Stopper underneath the spike bearing the least weight. Some experimentation may be worthwhile. Ideally, the least weight should be on the side where two spikes are positioned but unfortunately the loudspeaker or systems support manufacturers will have already positioned the spikes, and are inclined to place two spikes under the heaviest side rather than under the lightest side. Spike Stoppers enable loudspeakers and equipment to provide a sound quality that is superior to using traditional spikes alone, especially when used in conjunction with Statfeet. In the case of systems tables, especially where Statfeet are already in place under the equipment above, some experimentation may be necessary to determine the best position and orientation of the Statfoot. Start by placing the Statfoot under the front right hand Spike stopper as shown in the Statfoot instructions for televisions. In some cases, improvements can be obtained by turning the Statfoot clockwise 90°. Do not be surprised if there are marked changes in the sound as changes are made in the positioning and orientation of Statfeet. On a carpet, a Statfoot will crinkle and may not perform to its full potential unless a flat surfaced support is introduced between the Spike Stopper and the carpet. 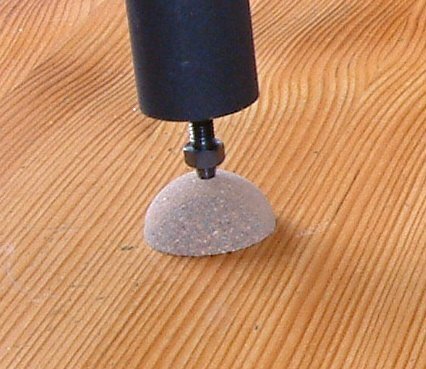 Further significant improvements in sound quality can be obtained using Spike Stoppers on top of Ringmat Feet – Cheetah, Tiger or Indian Jumbo, as appropriate for the weight, where small Spike Stoppers are used; African Jumbo or Mammoth Feet, as appropriate for the weight, where large Spike Stoppers are used.